Actor Darren McGavin Dies at 83, RIP. 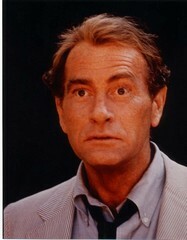 Darren McGavin passed away at the age of 83 from natural causes on Saturday. We truly have lost a great guy who has brought so much to the TV and movie industry and enjoyment to all of us over the years. His career was was endless stratching from the 1940’s to the present. BIO. These day Darren McGavin was best known as Ralphie’s dad on the 1983 Christmas Classic, “A Christmas Story.” A continual 24 hours of this tale on Christmas Eve brought McGavin into our homes on the holidays as Mr. Parker (Ralphie’s dad) was just priceless. He worked in profanity the way other artists might work in oils or clay. It was his true medium; a master. He looks like a deranged Easter Bunny, He does too, he looks like a pink nightmare! [after Mother "accidentally" breaks the Old Man's leg lamp] Why did you touch that? You were always jealous of this lamp. However, I will always remember Darren McGaven for one of the greatest TV shows of all time, Kolchak: The Night Stalker. In the 1970′s this show had no equal and kept you on the edge of your chair. The Night Stalker was a show way before its time. The concept of The Night Stalker series is of reporter Carl Kolchak, working for the Independent News Service in Chicago, encountering the unnatural. Each week he dealt with a supernatural (whether mystical, scientific, or alien) threat. The passing of Darren McGavin really does hit home as losing one of those pieces of your childhood. To the family of Darren McGavin, our condolences. To Mr. McGavin, thanks for all the memories.